Let's be honest: it's not a great time to be BlackBerry right now. Each morning brings yet more news stories that hint -- no, scream -- at the company's rapid unraveling. In the nine days following the announcement of the Z30, the company halted its BBM rollout and announced plans to fire 4,500 employees. Meanwhile, T-Mobile withdrew retail support, Motorola started sniffing around BlackBerry's top talent and its manufacturing partner looked for an exit. Finally, BlackBerry entered into a sale agreement, and the company had to concede that it lost a billion dollars on unsold Z10 handsets. So, what does all of this make the Z30? 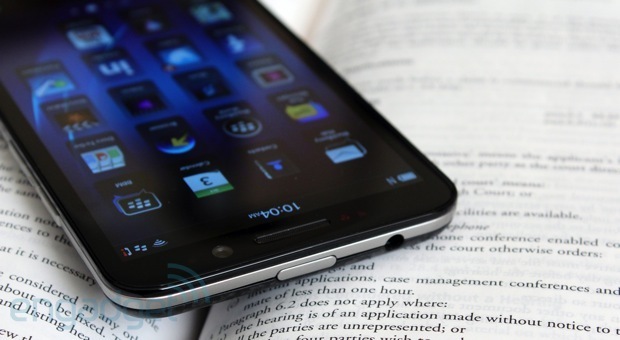 There had been plenty of rumors ahead of time that suggested BlackBerry would launch a phablet. The 5-inch Z30, however, isn't big enough to warrant that name, and the company itself has positioned the device as the flagship for the holiday season. That means the handset dodges comparisons with devices like the Galaxy Note, but instead stands in the line of fire between the iPhone 5s, Galaxy S 4, HTC One and Lumia 1020. Unlike those other devices, however, the Z30 isn't packing any flashy, headline-grabbing specs, nor does it offer bleeding-edge internals that will excite performance nuts. There's also the looming question of whether this hardware will make it over to the US in a timely fashion, as BlackBerry has only confirmed that it'll launch in Europe, the Middle East, Africa and the UK (priced at £500 off-contract). It's almost redundant to ask if this is the device that will save BlackBerry. After all, with the uncertainty surrounding the platform's future, we wouldn't be surprised if corporate buyers waited for the dust to settle before making more orders. Instead, let's ask if this handset, when judged on its own merits, is worth your cash. Is it the first step on a road to rejuvenation, or is the Z30 destined to become a footnote in technology history? BlackBerry’s first entry into the small tablet / big phone market gets about half of the key decisions right, but a high price, poor call quality and crash-prone software ultimately make it an also-ran. How would you rate the Z30? If you were expecting BlackBerry to simply glue on an extra 0.8 inch to the Z10 and knock off early, then you lose a point. While the Z10 had top-and-bottom horizontal bands that demarcated (and protected) the display, nearly the whole of the Z30 is covered in glass. Wisely, the forward-facing webcam, LED light and earpiece have been pushed closer to the edge to make room for that bigger 5-inch screen. At the bottom, you'll find an aluminum chin, which is a single piece of metal that connects to the frame of the device, holding the chassis together. 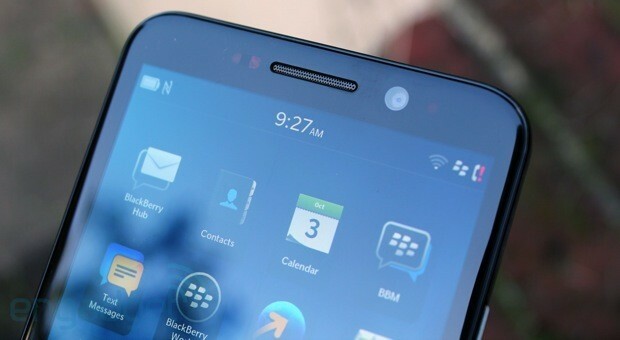 Sandwiched between the chin and the display is the BlackBerry logo, but otherwise, the rounded-off corners and glass covering make it look like a close relative of pretty much every other smartphone released in 2013. Lay this down next to a Galaxy S 4, and you'll find that while there's only a small difference in thickness, the Z30 is 4.1mm taller and 2.2mm wider. 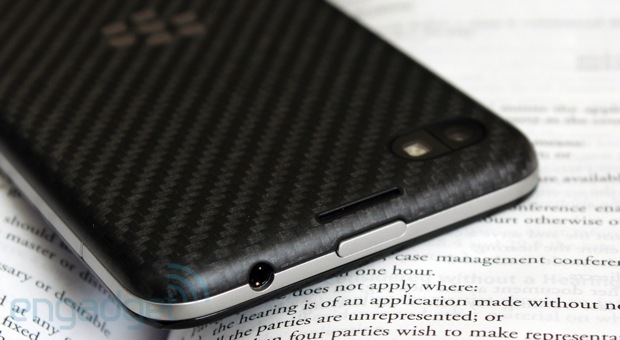 Flip the Z30 over and you'll find the woven carbon fiber back, dominated by the "seven flying D's" logo, which sits in the center. At the top and bottom edges, you'll find speaker grilles (one above, two below), while the primary camera module and flash are in their traditional top-left corner position. The back is removable, and it comes off with the usual nails-down-blackboard snapping and creaking that puts our teeth on edge. What isn't removable, however, is the battery. Much to the dismay of power users and road warriors, the company has decided to seal in the 2,880mAh power pack. That means that the only things you can access are the micro-SIM and microSD card slots, the latter of which is there to complement the 16GB of on-board storage. Those familiar with BB10 will remember that the software relies upon gestures rather than buttons, so, as with the Z10, there's a dearth of physical inputs here. Going around the frame, you've got the standard sleep/wake toggle and 3.5mm headphone jack on top. Down on the right, you've got the BlackBerry three-way volume rocker, with the central switch letting you activate voice control. The "down" volume button can be used to control the camera shutter, and both "up" and "down" keys can be customized to skip tracks when playing music. Port-wise, both the micro-USB and micro-HDMI-out ports are situated below the halfway point on the left-hand side. Take this out of the box and the first thing you'll notice is how pleasant this is to hold in the hand. Measuring 72mm wide and 9.4mm thick, it's hardly the thinnest big-screen smartphone on the market, but it's definitely not unwieldy, either. The only caveat we have to add here is that while it's possible to use this device one-handed, a few design decisions make that difficult. For instance, without a dedicated home button, you've got to rely that the sometimes unreliable up-swipe gesture works, or you'll have to shift your hand to hit the sleep/wake button before unlocking the screen, and it's ultimately much easier just to employ the second paw rather than look a fool on the train station platform. We must also discuss build quality, which, as you'd expect from a £500 smartphone, is quite high. Sturdy and without flex, this device is likely to take a heavy pounding and we'd expect it to survive a few drops onto concrete as long as you don't strike the screen directly. On the connectivity front, you'll find NFC, Bluetooth 4.0 and 802.11a/b/g/n nestled inside. The GSM version we tested was designed for the UK and EMEA, so it packs quad-band LTE on 3, 7, 8 and 20 (800/900/1800/2600), quad-band HSPA+ (800/850/900/1900/2100) and quad-band GSM/EDGE (850/900/1800/1900). Naturally, there's also the usual cadre of accelerometer, magnetometer, proximity sensor and gyroscope, as well as one rather interesting piece of hardware: a Paratek antenna, of which we'll talk about in a little more depth later on. Let's give credit where it's due: BlackBerry 10 is well-suited to large displays. Whereas the experience was cramped on the Q5 and Q10, the Z10's 4.2-inch screen did a reasonable job. Scale that up a little further, and we now actually find ourselves quite partial to the Z30's 5-inch Super AMOLED display. With a resolution of 1,280 x 720, you wind up with a pixel density of 295 ppi, and while it'd be easy to be snobby and compare it unfavorably to the Galaxy S 4's 441 ppi, this is still a perfectly usable screen. Viewing angles are superb, although, like with the Z10, there's a weird greenish color tint that you'll see if you approach the device from an angle that's nearly side-on. When reading emails, browsing the web and watching video, the Z30 is perfectly acceptable. That means that we don't have much to say about it either way. Considering its size, you won't suffer through dinner plate-sized pixels, but you will notice that video isn't as clear or un-grainy as it is on other, flashier devices. We've already mentioned the stereo speakers on the back, and while it's a regular gripe that speakers will be obscured in the hand, the Z30's are strong enough for that not to be an issue. In fact, when called upon to provide an impromptu cinema, it was able to entertain four people to a reasonable standard. The 8-megapixel sensor that sits on the back of BlackBerry Z30's shell should, in theory, do a quick and nimble job of taking high-quality snaps on the fly. On a clear day, pictures are bright, with vivid colors and lots of detail. Outside of those ideal conditions, however, our images started to look murky. 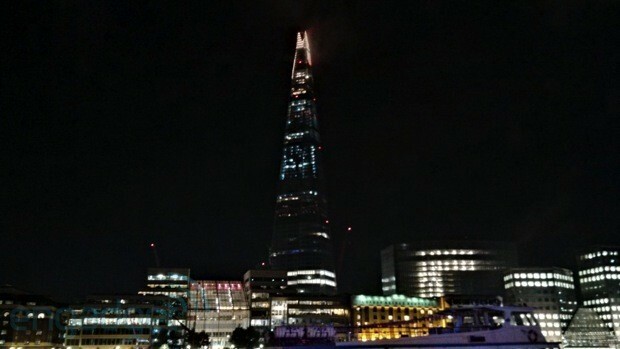 An orange-tinted evening along the Thames produced results with poor depth and the camera struggled to find focus. At night, the results tended to get worse, thanks to the glow of the artificial lighting. In some of the shots, there's enough lens flare to power a small J.J. Abrams movie. We also noticed that unless you're prepared to be patient and set up the "perfect" shot, you'll find the color balance and focusing to be slightly undesirable. We've already praised the HDR mode that BlackBerry introduced with the Q5, and we'll repeat ourselves here. Because BB10 can't take the pictures rapidly enough, HDR is really only usable with still tableaus, and we had to ditch more than a few of our sample images for a shaky hand or a pedestrian ghosting through the frame. On the upside, and when on-form, the images it produced were suitably dramatic and effective, and given your humble narrator's love of a dramatic skyline, we found the Z30's camera to be particularly effective. It's a similarly fair-weather experience with video: clips filmed on the street and in daylight were of high quality, and the microphone does a good job of masking wind noise. Users have a choice of recording clips at 720p or 1080p with an additional stabilization mode, but we found that the frame-jerking issue we experienced on the Q5 hasn't been resolved. As you can see from the clip, low-light performance isn't great either, although that fuzziness and low contrast mean the videos have a touch of artistic romance. There's also an annoying glitch whereby recorded video clips tack on a few extra frames of white, which makes editing the clips even more of a chore. The Z30 is the first BlackBerry handset to ship with BlackBerry OS 10.2. Given the company's renewed focus on business customers, it shouldn't come as a surprise to see that the biggest improvements here are aimed at the enterprise set. These include the ability to preview messages on the lock screen, BBM now becoming ubiquitous and the creation of the Priority Hub. In the lock screen, users can glance at the headers of the four most recently received emails, as well as the full text of their last four Twitter messages -- just by pushing the corresponding icon. Meanwhile, Priority Hub is a homegrown version of Google's Priority Inbox, which learns your email habits and selects messages from senders you regularly converse with as "important." 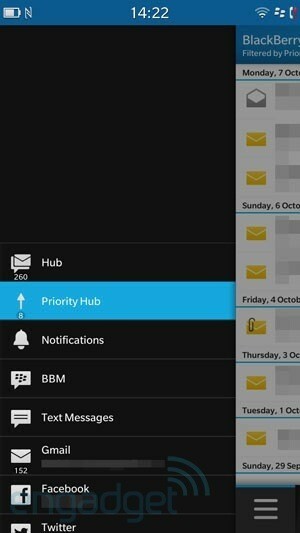 You then can access the Priority Hub as one of the options in the hub, next to BBM, Text messages or Facebook missives. Now it's time for us to share a small gripe concerning BB10 and its integration with Gmail. While adding our account to the handset was a breeze, using this on a daily basis can be frustrating. Given the near ubiquity of Gmail, you'd think that BlackBerry would have built in some options that we now take for granted. For instance, the lack of a simple archive or delete button means that all BB10 devices are useless for working through your emails unless you fancy pulling a double shift on them later. Perhaps it's a minor issue and we're making more of it, but this is a gripe that we think that you should be aware of, particularly if you or your company uses Google Apps for work mail. When it comes to BlackBerry App World, "Download the shortcut to the website now" is a depressingly familiar sight. While you can find some ported Android apps now in the store, the lineup is still sparse and there are too many third-party clients like Flix, which charges you £2.50 for a desktop-based workaround to let you watch Netflix on your smartphone. On the upside, BlackBerry 10.2 has been updated to run Jelly Bean-compatible apps, although that will require you to side-load apps that have been converted to the company's .BAR format. If you aren't feeling too confident about your chances, CrackBerry.com maintains an archive of pre-converted titles and numerous tutorials on the subject. On the bright side, BB10 handles multitasking with aplomb: as many times as we tried to force a slowdown with eight apps all running at once, it rarely stuttered. In the real world, however, there are some issues we need to tell you about. Take, for instance, the moment we wanted to turn the display off to pocket the device while entering a train barrier. Unfortunately, it refused, and even after our furious, panicked pressing, it wouldn't relent. That meant we had to pocket the phone still on to navigate the obstacle. Once we were through, however, it still wouldn't work -- and in fact we had to hold our finger on the power button and threaten a restart before we could coax it back to life. Then there was the time we switched from taking HDR images to normal mode, which prompted the phone to reboot itself. Another time, we tried to make a call, and the display refused to respond to our touches until we had, again, restarted the device. During a photo session, we were taking some sample images with the camera, and then put the phone down. When we resumed a few minutes later, the error message "The camera can't be started" greeted us. Naturally, all devices suffer the odd glitch or brownout, but when these things happen regularly during a single week of testing, we suspect that unless the company deals with the issue -- and fast -- plenty of people will be beating a path to return their phones to the store. Now, BlackBerry promises that our performance woes are unusual, and that we'll receive a fresh unit to continue our testing -- so if we find anything different, we'll update you here. One thing that BlackBerry, for all of its innovations, hasn't really improved upon here is its boot-up times. Yes, we know -- few of you even care how long it'll take for your phone to start from cold on those rare moments when you turn it off, but considering the lack of a removable battery, it may be something you quickly grow to care about. The boot-up clocks in at a minute flat, making it noticeably slower than other handsets. One of the most interesting things about this handset is that it contains a Paratek antenna. BlackBerry (or RIM, as it was called back in 2012) bought Paratek Adaptive RF (also known as Paratek Microwave Inc.) on the promise that the latter's cellular gear could work miracles. In short, Paratek's antenna is designed to boost data transmission rates in areas with low signal, which should hopefully prevent dropped calls and speed up your downloads -- theoretically saving battery life. Another by-product of the system is that it can apparently avoid "death grip" problems by tuning the antennas to constantly find the best signal. So, we went hunting for areas where network performance suffered to see if the Z30 could do better than the other devices we regularly use for testing. Unfortunately, the answer is no. At least in our limited, real-world tests, we found no meaningful difference between the Z30 and offerings from Apple, Nokia and Samsung. One of our biggest gripes with the Q5 was that call quality wasn't great; the audio was full of clicks, hisses and compression that'll annoy you if you're used to HD Voice calling. The experience was roughly the same here, with dropouts and the odd digital artifact that made conversations sound worse than an old-school satellite phone call on broadcast news. Data-wise, thanks to the lack of LTE across much of the UK, we weren't able to test the Z30's performance on bands 3, 7, 8 and 20, but found that it gobbled down data on Three UK's HSPA+ network as rapidly as on our other devices. BlackBerry promises that this smartphone will give you 25 hours of battery life with "mixed usage," a euphemism we take to mean that it should last a day between charges. In our standard video rundown test, with the display set at 50 percent, WiFi on (but not connected) and social networks set to poll at regular intervals, the Z30 was able to crank out 12 hours and 58 minutes. Day-to-day, we charged the device up overnight and then used it through until bedtime without ever seeing the charge icon fall past the halfway mark. As such, we'd suggest that most users can leave the spare external battery at home unless they're going somewhere remote. When Engadget reviewed the Q5, some of our readers felt that comparing that handset to similarly priced devices from other companies was unfair. This was because we weren't taking into account the enhanced security and enterprise-level features that BlackBerry offers on its handsets. However, a very recent InfoWorld study found that BB10 and iOS were comparable in terms of the security they offer, and that Samsung and Motorola Android devices were similarly secure, aside from the greater risk from malware. Considering that Samsung's Knox-enabled devices were given the same level of approval from the US Department of Defense, we do indeed feel comfortable comparing the Z30 to flagships from Samsung; not to mention Apple, Motorola and Nokia too. It's worth mentioning that the Z30 will be launching first in the UK and Middle East (two of BlackBerry's traditional strongholds), with no word on a US or Canadian debut (Update: Rogers has committed to carry the Z30). In real terms, that means you've either got to import it, or choose another BlackBerry 10 device. 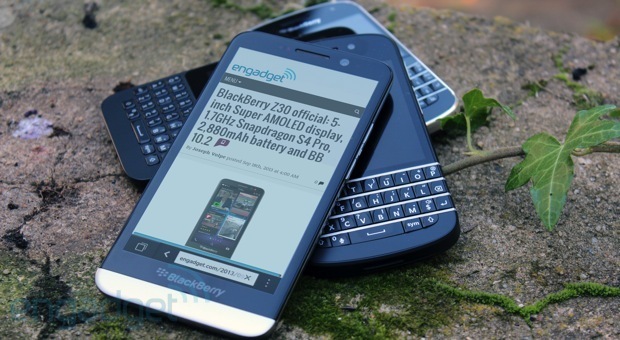 The company has admitted that there are only going to be four devices available between now and the start of 2014, with the Z10 (£300/$450), Q10 (£500/$550) and Q5 (£300/$360) rounding out the quartet. If, however, you're merely in the market for any smartphone, then you can also try the 5-inch Galaxy S 4 ($600/£400), the 4.7-inch HTC One ($600/£500) and the 4.7-inch Moto X (in the US, the Developer Edition is available for $600). For the reasons of balance, it's also worth mentioning that the iPhone 5s ($650/£550), which runs iOS, and the Lumia 1020 ($800/£600), which runs Windows Phone 8, are also fine alternatives. 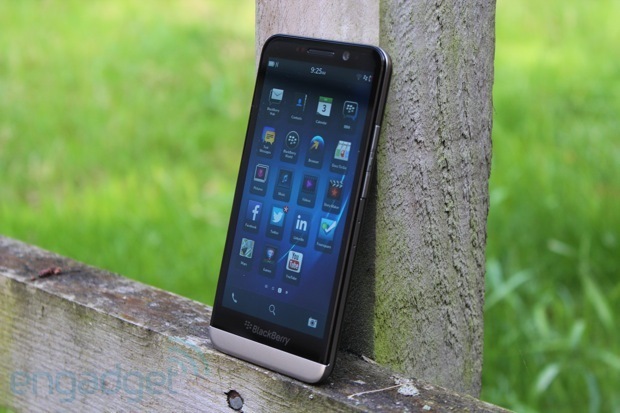 The BlackBerry Z30 has plenty of things going in its favor. It's well-designed, isn't cumbersome to hold and, despite its size, looks really stylish. Moreover, BlackBerry 10 is well-suited to a bigger display and the 5-incher here is a good one. So had the Z30 been the first BB10 device launched back in January, perhaps there would have been room for more optimism. 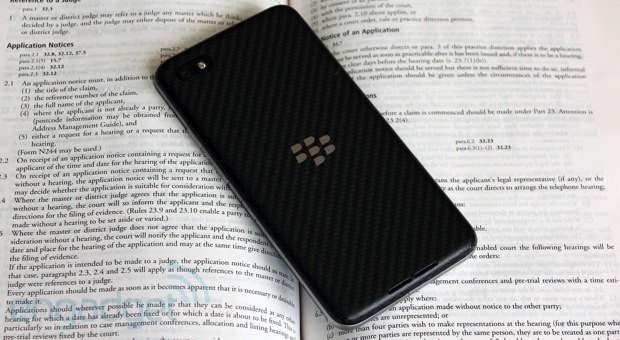 We're always full of praise for devices with a strong battery and, while BlackBerry diehards will be annoyed that the cell isn't removable, a 13-hour intensive stint still means it should last for a full day of work or keep you entertained on a long-haul flight. However, we can't be universal in our praise because there are so many small things that add up to a frustrating experience. The constant crashes, middle-of-the-road camera and poor call quality erase much of the goodwill the handset has otherwise earned. On one hand, the BlackBerry Z30 is the best BlackBerry 10 device yet, and if you're already a convert, this is the one we'd recommend. 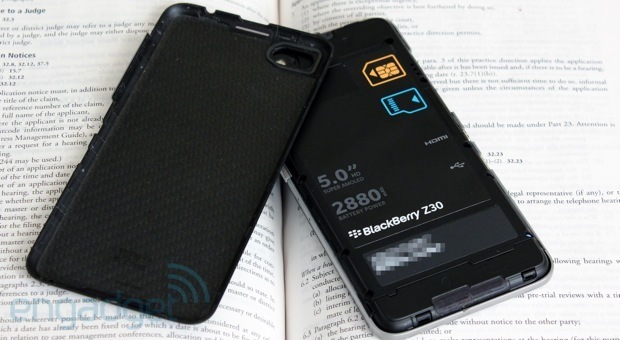 If you aren't a BlackBerry fan, however, then the situation's a little more nuanced. If you're looking to dump your Android, iOS or Windows Phone device in favor of the Z30, you have to ask yourself: Will you buy a device that really needs some urgent stability fixes -- not to mention the issues we've mentioned above? While we expect the Z30 to be cheaper in other territories, the £500 ($800) UK off-contract price will be another bitter pill for those looking to switch. The Z30 isn't a bad device by any means, just one that falls short of what we expect from a 2013-2014 flagship.